Vetcalls has expanded its mobile veterinary services to offer a full spectrum of services including the following: general checkups, vaccinations, health certificates, and wellness exams. We are also now carrying a full pharmacy for all of your pet’s medical needs. Email us using our contact form if you wish to receive a quote for any current or future need you have. 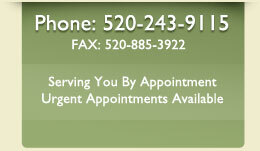 Tucson Veterinarian “Dr. 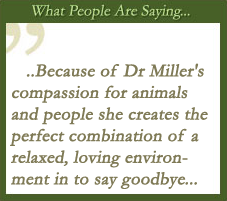 Maria” Miller serves you with compassion as she uses advanced techniques to carefully provide quality end of life pet care. You may be considering the peaceful and painless process known as “at home euthanasia” which is Dr. Maria’s main specialty. Hundreds of clients have chosen this option and then thanked Dr. Maria for her unique level of care. 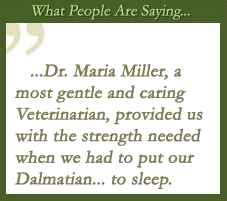 Dr. Maria prides herself on exceeding your expectations as she draws from over 10 years as a house call veterinarian who tailors her work to you and your pet’s unique personality and needs. Sit, Stay…Please listen to me!